Use Phrasal Verbs such as TAKE as much as possible. Native English speakers typically use plenty of Phrasal Verbs in everyday conversational English. 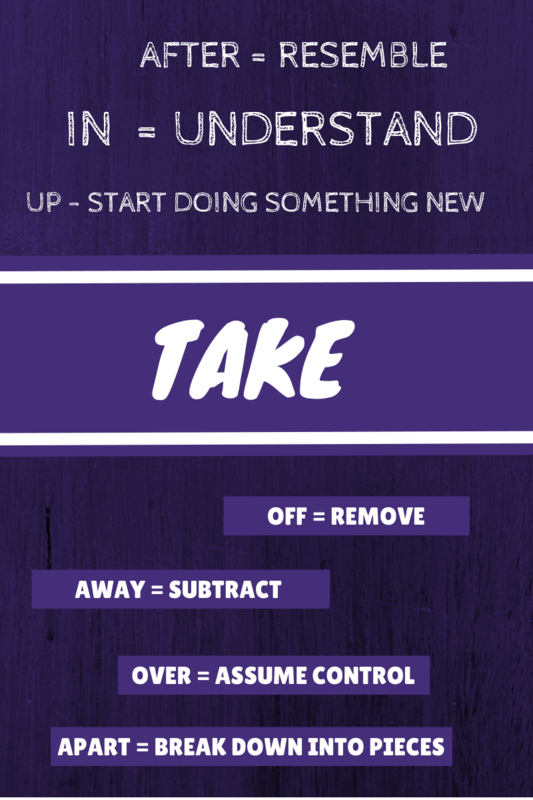 This is just a short list of Phrasal Verbs with TAKE – there are many more. to take up – to start learning or doing something new. She took up dancing when she was just 3 years old. to take away – to subtract. What number do you get if you take away 3 from 5? The answer is 2.
to take over – assume absolute control over something. Facebook has taken over as the most important social media site in the world. to take something back – to return. I didn’t like the colour of that dress so I took it back to the shop. to take off (1) – to remove. You must take off your makeup at bedtime. to take off (2) – to leave / depart. The plane was delayed. It was scheduled to leave at 5p.m. but didn’t take off until 5.30p.m. to take something apart – to break down into pieces. After you use the food processer, you must take it apart to clean it. to take after somebody – to resemble. She really takes after her father. Not only does she look like him, but her character is also very similar to his. to take something in – to understand or comprehend. It came as a such a shock when the stock market crashed that he couldn’t quite take in the fact that he’d lost all his money. to take on – assume responsibility for something. He didn’t want to take on the responsibility of being the chairman of the committee. English Teacher’s Tip: Take the quiz below to check your understanding of using TAKE as a PHRASAL VERB. Why not create you own Phrasal Verb list with an online tool. Another trick to help you remember phrasal verbs is to try and write your own sentences. If you personalise them, you are more likely to remember them. TAKE THIS QUIZ AND FIND OUT WHETHER YOU CAN USE ‘TAKE’ AS A PHRASAL VERB! More Multi-Word Verbs: LOOK, COME, GO, MEET, GET, PHRASAL VERBS WITH BACK.